Publius Vergilius Maro (Classical Latin: [ˈpuː.blɪ.ʊs wɛrˈɡɪ.lɪ.ʊs ˈma.roː]; traditional dates October 15, 70 BC – September 21, 19 BC), usually called Virgil or Vergil (/ˈvɜːrdʒɪl/) in English, was an ancient Roman poet of the Augustan period. He wrote three of the most famous poems in Latin literature: the Eclogues (or Bucolics), the Georgics, and the epic Aeneid. A number of minor poems, collected in the Appendix Vergiliana, are sometimes attributed to him. The works of Virgil almost from the moment of their publication revolutionized Latin poetry. The Eclogues, Georgics, and above all the Aeneid became standard texts in school curricula with which all educated Romans were familiar. Poets following Virgil often refer intertextually to his works to generate meaning in their own poetry. The Augustan poet Ovid parodies the opening lines of the Aeneid in Amores 1.1.1–2, and his summary of the Aeneas story in Book 14 of the Metamorphoses, the so-called "mini-Aeneid", has been viewed as a particularly important example of post-Virgilian response to the epic genre. 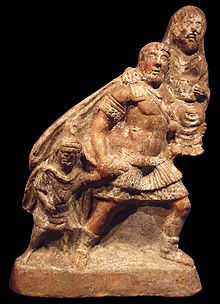 Lucan's epic, the Bellum Civile has been considered an anti-Virgilian epic, disposing with the divine mechanism, treating historical events, and diverging drastically from Virgilian epic practice. The Flavian poet Statius in his 12-book epic Thebaid engages closely with the poetry of Virgil; in his epilogue he advises his poem not to "rival the divine Aeneid, but follow afar and ever venerate its footsteps." In Silius Italicus, Virgil finds one of his most ardent admirers. With almost every line of his epic Punica Silius references Virgil. Indeed, Silius is known to have bought Virgil's tomb and worshipped the poet. Partially as a result of his so-called "Messianic" Fourth Eclogue – widely interpreted later to have predicted the birth of Jesus Christ – Virgil was in later antiquity imputed to have the magical abilities of a seer; the Sortes Vergilianae, the process of using Virgil's poetry as a tool of divination, is found in the time of Hadrian, and continued into the Middle Ages. In a similar vein Macrobius in the Saturnalia credits the work of Virgil as the embodiment of human knowledge and experience, mirroring the Greek conception of Homer. 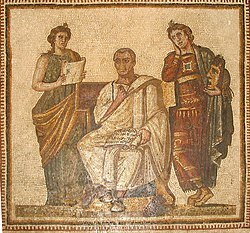 Virgil also found commentators in antiquity. Servius, a commentator of the 4th century AD, based his work on the commentary of Donatus. Servius' commentary provides us with a great deal of information about Virgil's life, sources, and references; however, many modern scholars find the variable quality of his work and the often simplistic interpretations frustrating. Even as the Western Roman empire collapsed, literate men acknowledged that Virgil was a master poet. Gregory of Tours read Virgil, whom he quotes in several places, along with some other Latin poets, though he cautions that "we ought not to relate their lying fables, lest we fall under sentence of eternal death." 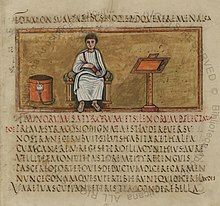 The best-known surviving manuscripts of Virgil's works include the Vergilius Augusteus, the Vergilius Vaticanus and the Vergilius Romanus. The legend of "Virgil in his basket" arose in the Middle Ages, and is often seen in art and mentioned in literature as part of the Power of Women literary topos, demonstrating the disruptive force of female attractiveness on men. In this story Virgil became enamoured of a beautiful woman, sometimes described as the emperor's daughter or mistress and called Lucretia. She played him along and agreed to an assignation at her house, which he was to sneak into at night by climbing into a large basket let down from a window. When he did so he was hoisted only halfway up the wall and then left trapped there into the next day, exposed to public ridicule. The story paralleled that of Phyllis riding Aristotle. 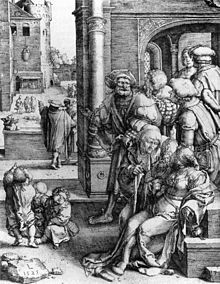 Among other artists depicting the scene, Lucas van Leyden made a woodcut and later an engraving. 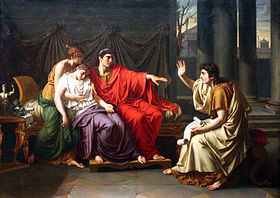 In the Middle Ages, Virgil's reputation was such that it inspired legends associating him with magic and prophecy. From at least the 3rd century, Christian thinkers interpreted Eclogues 4, which describes the birth of a boy ushering in a golden age, as a prediction of Jesus' birth. In consequence, Virgil came to be seen on a similar level to the Hebrew prophets of the Bible as one who had heralded Christianity. Relatedly, The Jewish Encyclopedia argues that medieval legends about the golem may have been inspired by Virgilian legends about the poet's apocryphal power to bring inanimate objects to life. Possibly as early as the second century AD, Virgil's works were seen as having magical properties and were used for divination. In what became known as the Sortes Vergilianae (Virgilian Lots), passages would be selected at random and interpreted to answer questions. In the 12th century, starting around Naples but eventually spreading widely throughout Europe, a tradition developed in which Virgil was regarded as a great magician. Legends about Virgil and his magical powers remained popular for over two hundred years, arguably becoming as prominent as his writings themselves. Virgil's legacy in medieval Wales was such that the Welsh version of his name, Fferyllt or Pheryllt, became a generic term for magic-worker, and survives in the modern Welsh word for pharmacist, fferyllydd. The structure known as "Virgil's tomb" is found at the entrance of an ancient Roman tunnel (also known as "grotta vecchia") in Piedigrotta, a district 3 kilometres (2 mi) from the centre of Naples, near the Mergellina harbor, on the road heading north along the coast to Pozzuoli. While Virgil was already the object of literary admiration and veneration before his death, in the Middle Ages his name became associated with miraculous powers, and for a couple of centuries his tomb was the destination of pilgrimages and veneration. 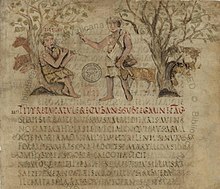 By the fourth or fifth century AD the original spelling Vergilius had been corrupted to Virgilius, and then the latter spelling spread to the modern European languages. The error probably originated with scribes reproducing manuscripts by dictation. The error persisted even though, as early as the 15th century, the classical scholar Poliziano had shown Vergilius to be the original spelling. Today, the anglicisations Vergil and Virgil are both acceptable. ^ Jones, Peter (2011). Reading Virgil: Aeneid I and II. Cambridge University Press. pp. 1, 4. ISBN 978-0521768665. Retrieved 23 November 2016. ^ Bunson, Matthew (2014). Encyclopedia of the Roman Empire. Infobase Publishing. p. 584. ISBN 978-1438110271. Retrieved 23 November 2016. ^ Roberts, John (2007). The Oxford Dictionary of the Classical World. Oxford University Press. ISBN 978-0192801463. Retrieved 23 November 2016. ^ Ruud, Jay (2008). Critical Companion to Dante. Infobase Publishing. p. 376. ISBN 978-1438108414. Retrieved 23 November 2016. ^ The epitaph on his tomb in Posilipo near Naples was Mantua me genuit; Calabri rapuere; tenet nunc Parthenope. Cecini pascua, rura, duces ("Mantua gave birth to me, the Calabrians took me, now Naples holds me; I sang of pastures [the Eclogues], country [the Georgics] and leaders [the Aeneid]"). 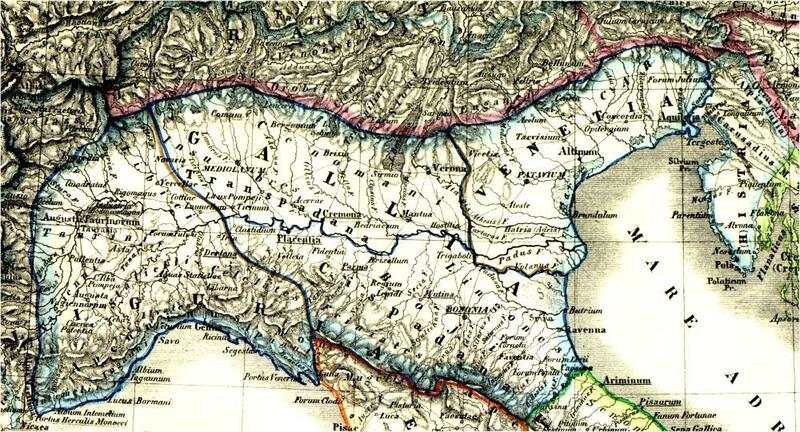 ^ "Map of Cisalpine Gaul". gottwein.de. Archived from the original on 2008-05-28. ^ Avery, W.T. (1957). "Augustus and the "Aeneid"". The Classical Journal. 52 (5): 225–229. ^ Sellar, William Young; Glover, Terrot Reaveley (1911). "Virgil". Encyclopædia Britannica. 28 (11th ed.). New York : Encyclopaedia Britannica. p. 112. Retrieved 2012-06-07. ^ Miller, F.J. (1909). "Evidences of Incompleteness in the "Aeneid" of Vergil". The Classical Journal. 4 (11th ed.). pp. 341–355. JSTOR 3287376. ^ Alighieri, Dante (2003). The Divine Comedy (The Inferno, The Purgatorio, and The Paradiso). New York: Berkley. ISBN 978-0451208637. ^ Ziolkowski, Jan M.; Putnam, Michael C. J. (2008). The Virgilian Tradition: The First Fifteen Hundred Years. Yale University Press. pp. xxxiv–xxxv. ISBN 978-0300108224. Retrieved November 11, 2013. ^ Singer, Isidore; et al., eds. (1901–1906). "Golem". The Jewish Encyclopedia. New York: Funk & Wagnalls. ^ Ziolkowski & Putnam, pp. xxxiv, 829–830. ^ Ziolkowski & Putnam, p. xxxiv. ^ Ziolkowski & Putnem, pp. 101–102. ^ Chambers, Robert (1832). The Book of Days. London: W and R Chambers. p. 366. ^ Comparetti, Domenico (1997). Vergil in the Middle Ages. Princeton University Press. ISBN 978-0691026787. Retrieved 23 November 2016. ^ Wilson-Okamura, David Scott (2010). Virgil in the Renaissance. Cambridge University Press. ISBN 978-0521198127. Retrieved 23 November 2016. ^ Winkler, Anthony C.; McCuen-Metherell, Jo Ray (2011). Writing the Research Paper: A Handbook. Cengage Learning. p. 278. ISBN 978-1133169024. Retrieved 23 November 2016. Anderson, W.S., and L.N. Quartarone. Approaches to Teaching Vergil's Aeneid. New York: Modern Language Association of America, 2002. Buckham, Philip Wentworth; Spence, Joseph; Holdsworth, Edward; Warburton, William; Jortin, John. Miscellanea Virgiliana: In Scriptis Maxime Eruditorum Virorum Varie Dispersa, in Unum Fasciculum Collecta. Cambridge: Printed for W.P. Grant, 1825. Conway, R.S. (1915). The Youth of Vergil: A Lecture Delivered in the John Rylands Library on 9 December, 1914. s.n. Farrell, J., and Michael C.J. Putnam, eds. A Companion to Vergil's Aeneid and Its Tradition. Blackwell Companions to the Ancient World. Literature and Culture. Chichester/Malden, MA: Wiley-Blackwell, 2010. Farrell, J. "The Vergilian Century". Vergilius (1959–), vol. 47, 2001, pp. 11–28. Farrell, J. Vergil's Georgics and the Traditions of Ancient Epic: The Art of Allusion in Literary History. New York: Oxford University Press, 1991. Fletcher, K.F.B. Finding Italy: Travel, Nation and Colonization in Vergil's 'Aeneid'. Ann Arbor: University of Michigan Press, 2014. Hardie, Philip R., ed. Virgil: Critical Assessments of Ancient Authors. 4 vols. New York: Routledge, 1999. Henkel, J. "Vergil Talks Technique: Metapoetic Arboriculture in 'Georgics' 2." Vergilius (1959–), vol. 60, 2014, pp. 33–66. Horsfall, N. The Epic Distilled: Studies in the Composition of the Aeneid. Oxford and New York: Oxford University Press, 2016. Mack, S. Patterns of Time in Vergil. Hamden: Archon Books, 1978. Panoussi, V. Greek Tragedy in Vergil's "Aeneid": Ritual, Empire, and Intertext. Cambridge and New York: Cambridge University Press, 2009. Quinn, S., ed. Why Vergil? A Collection of Interpretations. Wauconda: Bolchazy-Carducci, 2000. Rossi, A. Contexts of War: Manipulation of Genre in Virgilian Battle Narrative. Ann Arbor: University of Michigan Press, 2004. Sondrup, Steven P. (2009). "Virgil: From Farms to Empire: Kierkegaard's Understanding of a Roman Poet" in Kierkegaard and the Roman World, ed. Jon Bartley Stewart. Farnham: Ashgate. Syed, Y. Vergil's Aeneid and the Roman Self: Subject and Nation in Literary Discourse. Ann Arbor: University of Michigan Press, 2005. Syson, A. 'Fama' and Fiction in Vergil's 'Aeneid'. Columbus: Ohio State University Press, 2013. Virgil: The Major Texts: contemporary, line by line English translations of Eclogues, Georgics, and Aeneid. Publii Vergilii Maronis Opera Naples and Milan, 1450. Publii Vergilii Maronis Opera Italy, between 1470 and 1499. Publii Vergilii Maronis Opera Milan, 1465. Project Gutenberg edition of Vergil – A Biography, by Tenney Frank. The article above was originally sourced from Nupedia and is open content. This page was last edited on 14 April 2019, at 22:26 (UTC).